Today I’m sharing a picture of me when I was 3. I had just received my rocking chair my Paw-Paw made for me! He was a very talented craftsman. I also included a picture of my 3 year old son. Everyone says he looks like me, but you can be the judge of that. I love this chair and will cherish it forever. I love seeing my little ones using it! Please share your favorite family-friendly post. Wordless or Not So Wordless! I will try my best to visit and comment on all post linked up to my party! I will pin my favorites to Pinterest! Bloglovin, Facebook, Pinterest, Twitter, Instagram or Google+. Now let’s have a Linky Party! What a cool picture! I love those memories to share with the next generation! Cute photos. You were adorable as is your son. Love seeing family pics together! It makes it easy to see how much we resemble each other. Oh so sweet. Found you on BMN Facebook page. I have several things that I have kept for years – but they are all clothes or blankies that I used. No furniture here. What a wonderful heirloom. SO CUTE! And you guys look alike! Craziness. Genetics, I tell you. I recently had a similar comparison my my blog, between the little girl for whom I nanny, and my brother when he was small..looking back is so much fun. 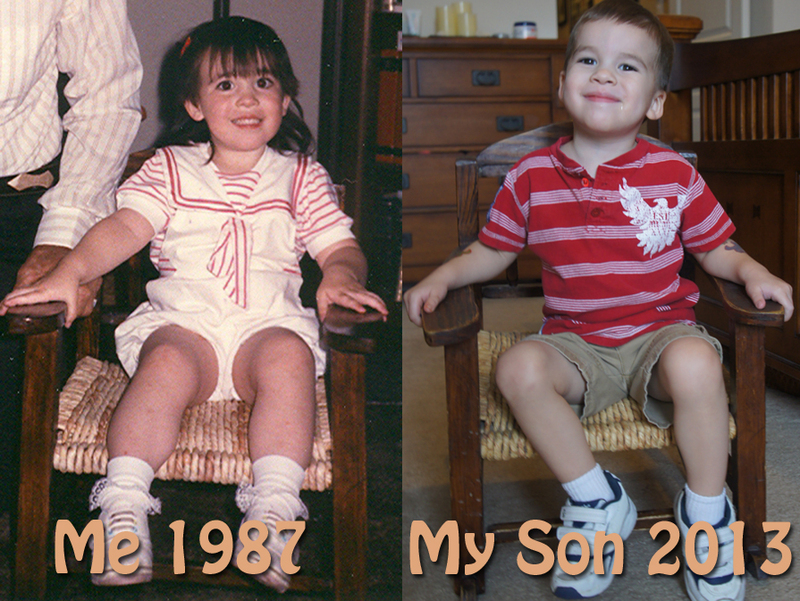 I love seeing similarities between when I was small, and the children with whom I work now. And the chair still looks just as good today, he did a great job on it indeed. Yes Pat it does! That little chair has many years left in it! I love this! I was bummed to not keep the one my 13 year old had for my now 2 year old. This would be even more amazing.